How can I challenge an appraisal? I am sorry to hear that you are unhappy with the appraisers work. Three thoughts immediately come to mind; The substantial correction recently in home values, in many places around the US, the appraisal is simply one person’s opinion, and, appraisers are not paid to agree with their clients. Now that I expressed my initial reactions, my personal experiences are that, like the rest of us, appraisers certainly do make mistakes. Monty’s Answer: Hello Sandra and Don. I am sorry to hear that you are unhappy with the appraisers work. Three thoughts immediately come to mind; The substantial correction recently in home values, in many places around the US, the appraisal is simply one person’s opinion, and, appraisers are not paid to agree with their clients. Now that I expressed my initial reactions, my personal experiences are that, like the rest of us, appraisers certainly do make mistakes. For you to challenge the appraiser successfully, you will have to demonstrate a solid reason to convince them to reconsider. You paid them for their opinion. To reach a conclusion the appraiser has a duty to verify all of the information assembled in the document. It is relatively easy to correct the error when the home’s square footage or an outbuilding was not properly accounted for. It may be more difficult to convince them to make a change when their documentation is correct, and the conclusion is causing the disagreement. Neither appraisers nor real estate agents take the time to educate consumers about the theory, the regulation and the nuances of the appraisal process. As a result, it is not uncommon for questions and disagreements to arise. While I believe I answered your question, I am also providing a short course toward a better understanding the appraiser’s work. 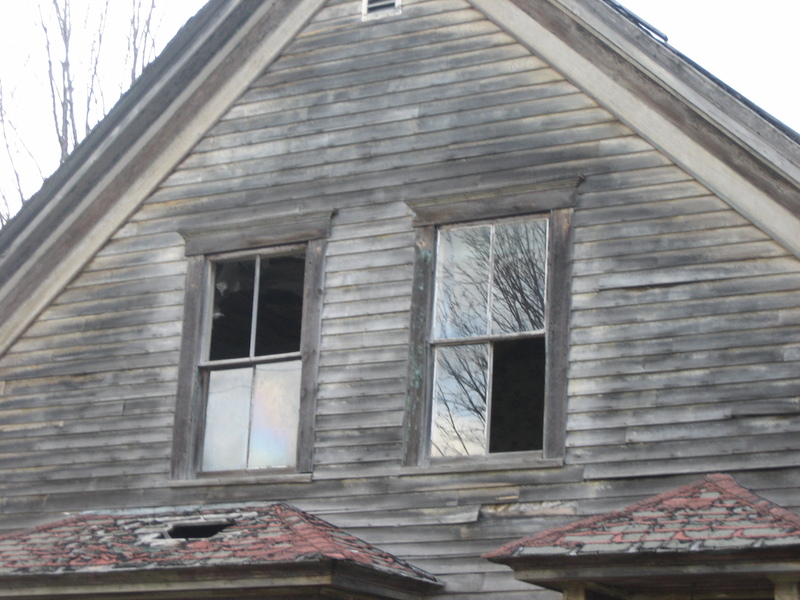 You will discover information that may provide the kernel you need to identify an error that contributed to the appraiser’s conclusion of value. Neither the real estate appraiser nor the real estate agent will be writing out a check for their portion of the purchase price. So, in determining a home’s value, why do home buyers and home sellers often abdicate the responsibility to them? Sure, we look at the appraisers report or the agents Competitive Market Analysis (CMA), but most often, there is little or no time spent educating the customer on the theory, the main approaches to value and, most importantly, how the agent or appraiser decided which comparable properties were appropriate. Most buyers and sellers do not know how to determine the value of a home. Consequently, they do not know the critical questions to ask. This dependency on the agent CMA or the home appraisal as the “expert” is truly understandable. The state licenses appraisers to do business. They should know values. Assuming all the verifiable information about the home is documented, it is the choice of comparables and the resulting value adjustments that form the basis of the opinion rendered. Lastly, consider that the appraisal report is just one persons opinion of value. That is a significant reason a seller should interview multiple agents. Gain confidence in your decisions. Know how to ask the agent or appraiser the right questions. Become a better negotiator because you have better information. Know which information to ask your agent to retrieve from the MLS. Why Are There 3 Approaches To Value? Cost Approach – Replacement cost. When evaluating a home always remember that cost sets the upper limit of value. What would it cost to build? This is a fundamental question to ask. The main limitation of the cost approach is that it only deals with one element of the transactions occurring in the marketplace. Income Approach – All improved real estate has economic value. There are two choices for homes, occupy or rent. When property can produce income, that income determines rates of return on capital invested. The marketplace dictates the rents based on supply and demand. It is a serious question to ask. How much rent will the home generate? The limitation with this method is that often there is little or no rental market where you want to live. Finding comparable rentals is more difficult as leases are not often recorded as are deeds. Market Approach – Law of supply and demand is the driving force. What are similar homes selling for in the neighborhood? How many similar homes are offered currently? How often does one of these homes sell? The market approach is the primary focus of the three approaches to value for single family homes. Where there are calculable differences, adjust the features considered between the comparable sales and the subject property. Never adjust the subject, only the comparables. The goal is to adjust the comparable home to make it like the subject, on paper. Not all features will require adjustment. Sometimes the compared feature shows the comparable is less valuable than the subject. In these circumstances, add value to that feature to bring it up to the subject property. Sometimes the feature in the comparable is more valuable than the feature in the subject. In these circumstances, subtract value from that feature to bring it down to the subject property. The formula for adjusting comparables is: plus (+) if the subject is better, minus (-) if the subject is lesser. The schedule below demonstrates suggested price adjustments of features in an average American home. Average is a home selling for $175,000. 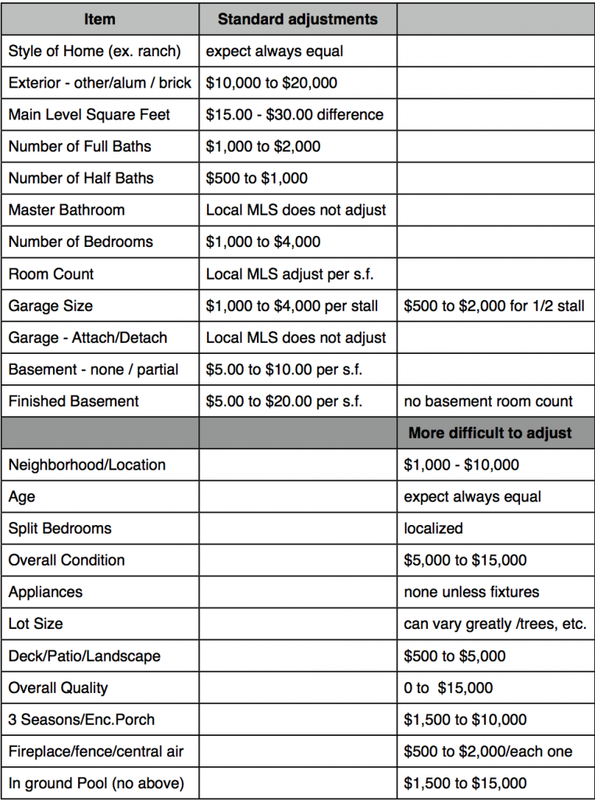 If prices where you live are higher or lower, the suggested prices below may require adjustment. You and your agent can determine if these price adjustments require modification. When you have made adjustments on each comparable sale, the net result will show different adjusted values of each comparable. These differences represent the “range of value” of the subject property. As the number of comparables diminish the range of value for the subject property grows wider. In a tract subdivision with many homes designed with the same floor plan and different street elevations the range of value may be five percent. On a one-of-a-kind rural home where it is a stretch finding three comparables and large adjustments are made between features the range of value could be thirty percent or higher. If the total adjustments after the additions and subtractions net out to be over $25,000, ask yourself if you have the best comparables. Most agents skip driving the comparables. In some cases, they have seen them before. Appraisers are required to drive by the comparables. While this is the practice in the real estate industry, the appraiser driving by the homes adds considerable value to deciding which properties are beneficial comparables. You can learn a lot driving the comparables yourself. The property should be located in the neighborhoods you are seeking to live in, so you may spot a new listing you were not aware of. A lack of comparables creates a wider range of value. This is one of the reasons rural property, unusual or exceptionally high valued homes are so difficult to evaluate. I recommend practicing with a few homes. See how close to predicting the final sale price you can come on home sales in the neighborhood. After all, many classes teaching consumers how to buy stocks have them practice at it before they “jump in”. This is an even larger investment, so it makes complete sense empowering yourself to succeed. If you know a home appraiser, check out the adjustment values the local appraisers are using when they make their adjustments. The adjustment presented here represent typical calculations for a $175,000 home in Brown County, WI and were reviewed by Joel Tetzner – Act One Appraisals in Green Bay, WI. Sandra and Don, Thank You for asking your question. I hope this information helps you discover an error or gain an appreciation for the appraisal. Good Luck.